Movie will not take place in the event of rain. Please continue to check our website and Facebook for updates. 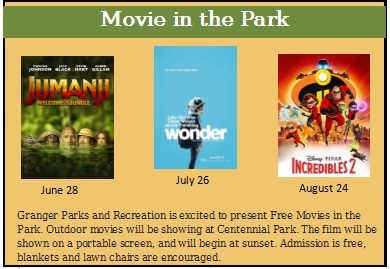 Description Granger Parks and Recreation is excited to present Free Movies in the Park. Outdoor movies will be showing at Centennial Park. The film will be shown on a portable screen, and will begin at sunset. Admission is free, blankets and lawn chairs are encouraged.